But if you can reserve time on Sunday, March 4, there is a cause to come out for at Chicago's North Avenue Beach. It's a 12-year tradition that involves taking a dip in Lake Michigan when the water is most likely frigid, maybe even a little wavy, and most definitely going to shock your system (but hey, that's where bragging rights come in!). It's the Chicago Polar Plunge, benefiting SCC/Special Olympics Chicago. 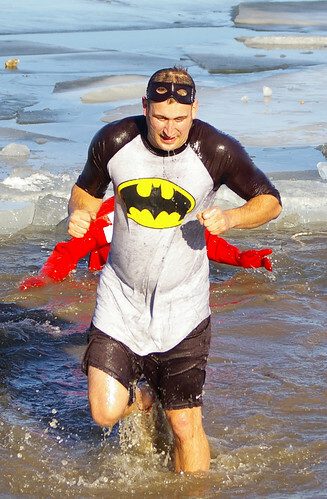 "The Polar Plunge is the top fundraising event of the year for Special Olympics Chicago," said James Sheahan, President of SCC/Special Olympics Chicago. "The day is a fun and inspirational event for those attending. But more importantly, the Chicago Polar Plunge helps to change the lives of over 5,000 Chicago-area Special Olympians, by providing much of the funding necessary to provide year-round activities, programs and events for our athletes. It is a tremendously important event for Special Olympics Chicago and its athletes and families." This event has become a "must do" for Chicagoans--and with this winter being as mild as it's been, it makes even more sense to be a part. Those icy waters might not be as bad as they could be, and you might not feel as frozen whether you opt for the full dip or the waist-high challenge as you would in years past. More than 1,700 plungers entered Lake Michigan last year, and this year's Plunge is expected to bring even more water warriors. The Polar Plunge kicks off at 10 a.m. at North Avenue Beach, and registrants are asked to raise a minimum of $125. After taking the dive, participants are invited to the "Melt Down Party" which takes place inside the North Avenue boathouse and expanded heated tents from 11 a.m. to 2 p.m. There you'll be able to warm up, refuel and have fun with fellow Plungers. As past pictures illustrate on the Polar Plunge website, costumes are welcome and even encouraged (prizes are awarded for best group costume and top three individual costumes). To learn more and to register, visit www.sochicago.org. Or can't make this event but want to help Special Olympics? Consider running the Chicago Marathon with their team. There's no fee to join the team, and they might still have entries left for the October race in exchange for your fundraising. Photo grabbed from eagle102.net at flickr.